Titan is our 2-year-old male brindle pit bull. He is a rescue dog from a local rescue group, Pitty Love Rescue, located in Rochester, N.Y. Titan was adopted at approximately 8 weeks of age. Titan lives at home with us and our 8-year-old Rottweiler, Max, as well as with our other pit bull rescue dog, Yuna, a 1-year-old female. Titan is a very loving dog and can’t be without his family – including his “brother and sister.” Titan loves to go for runs and recently has started dog agility classes. He loves to sleep on the couch and to try to climb into bed in the middle of the night with Mom and Dad. Titan also loves to go to his “Grandma’s” house to visit his friends. Titan has two friends at her house, including a 6-year-old Schnoodle named Romeo, and his best friend Rascal. Rascal is my sister’s mosaic chinchilla, and he lives in a four-tier cage in my sister’s room. He is 7-years-old. She has had him since he was a baby. As soon as we get to Grandma’s, Titan runs for my sister’s room to visit his friend. Titan gets so excited that he just can’t wait until the door opens! When they first met, Titan was very timid and unsure of his new acquaintance. 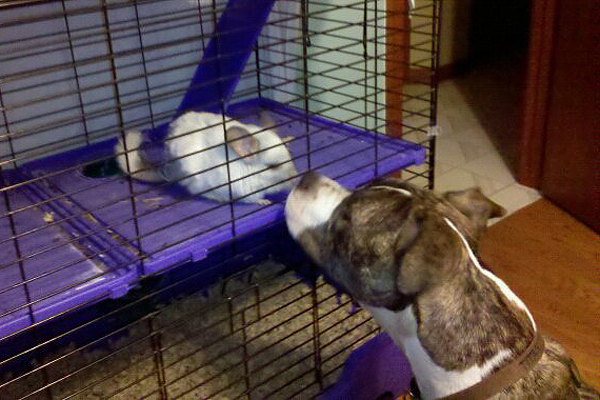 Rascal climbed down to the bottom of the cage and began bouncing around and squeaking at Titan. Titan was very cautious but slowly gained enough courage to go near the cage. Titan and Rascal touched noses, and they became friends. Titan pounces around the bedroom playing and barking, while Rascal runs around his cage squeaking at him. When Rascal disappears at the top of his cage, Titan has to jump up to see where his friend went. Titan and Rascal have become great friends since they met about a year and a half ago. They both get very excited at their visits, and when Titan leaves they get anxious for their next one! A testament to the true nature of these dogs. Adorable to see this inter-species friendship! The squeaking mixed w barking must make you all laugh and laugh! Enjoy! thanks for sharing this story!